The value investing philosophy has several key characteristics that distinguish it from other investment styles. The underlying theorem is that the price quote of a share, which is readily available and assigned by the market, often differs from the underlying value of the company. This underlying value is known as the intrinsic value, the discounted value of the company’s future distributions. Based on a company’s financial statements, the intrinsic value can be estimated. If the share price is greater than the intrinsic value, the company is considered overvalued. Conversely, companies with share prices trading below the intrinsic value are undervalued. Value investing is a contrarian investment style that sets out to find companies trading below their intrinsic value. One could argue these companies are traded at a “discount”, often referred to as the margin of safety. Indeed, if a company is already traded below its intrinsic value, then the risk of further price decreases is limited. Protection against downside risk is a key component of the value investing approach, as the primary investment goal is preservation of capital. Undervalued companies are often considered boring and unpopular. These are stable companies with proven business models that generate steady cash flows, carry very little debt, and trade at low price-to-book and price-to-earnings ratios. Conversely, growth stocks are highly popular companies that carry a lot of “expectation value” based on future trends rather than current earnings. As the remainder of this article will demonstrate, value investing significantly outperforms other investment styles in the long run. 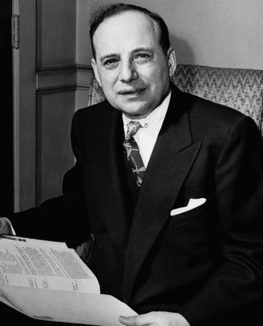 Benjamin Graham is the father of the value investing approach, which he introduced in the 1930s and 1940s. His books Security Analysis (1934) and The Intelligent Investor (1949) are considered timeless classics with lessons that still apply today. Graham taught that Mr. Market (an allegory for the stock market) generally provides plausible price quotes, but sometimes price quotes are ludicrous. The investor can either agree or disagree with the quoted price and make the trade, or ignore Mr. Market completely. The investor should not be influenced by the fickle nature of the market to determine the true value of his shares, but rather do his own due diligence. He is then able to benefit from inflated prices by selling his shares above their calculated value. The lesson is that investors should assess the real performance of the companies they invest in, and not get carried away by the often irrational prices that occur in the stock market. 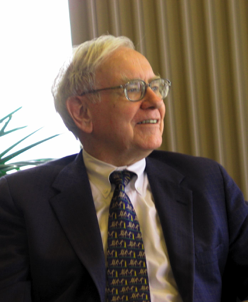 Graham’s disciple Warren Buffett popularized this investment style with his investment vehicle Berkshire Hathaway, achieving annualized returns over 20% for an extended period starting in 1965. Buffett, together with his partner Charlie Munger, is renowned as one of the most successful investors of all time. 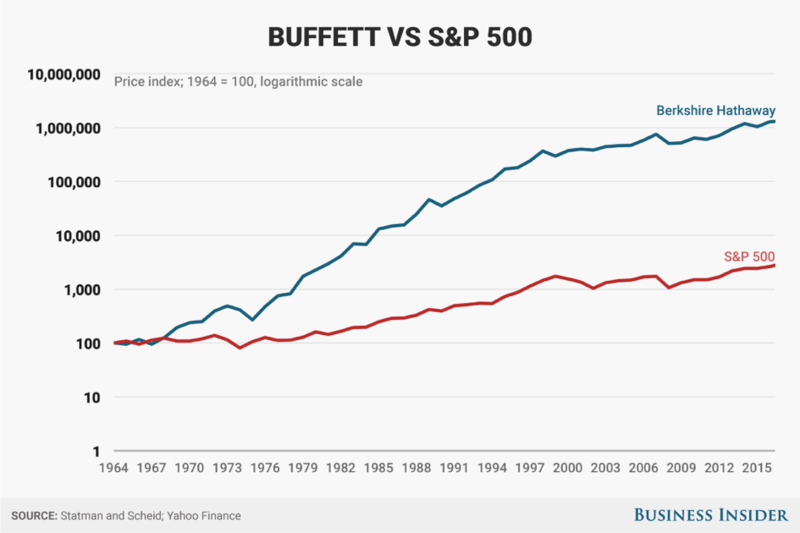 Buffett and Munger further developed the value investing approach, by adding several characteristics to a company before considering an investment. For instance, they added the quality of management as a key characteristic. Furthermore, economic moat was added as a vital characteristic. Economic moat means that a company has a significant competitive advantage compared to its industry peers. Economic moat could be the brand name, significant barriers to market entry, pricing power or (semi-)monopolistic market shares. Even when using a logarithmic scale, the performance difference is night and day. 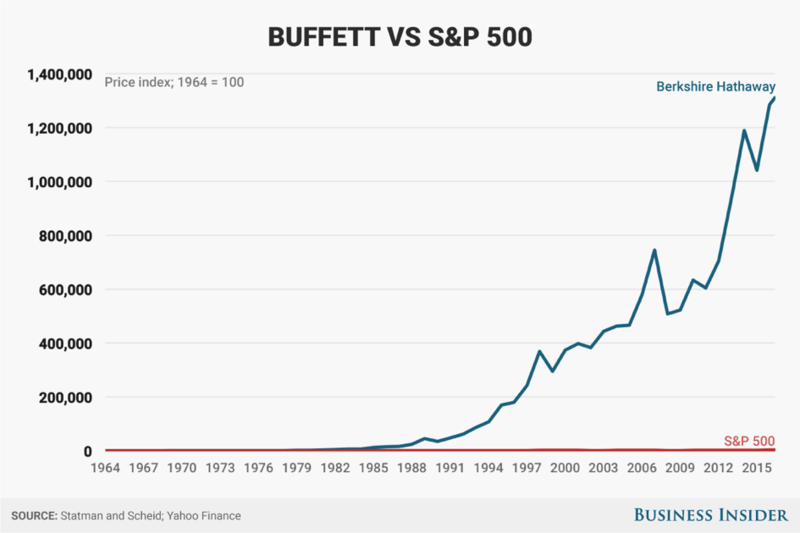 From 1964 to 2016, Berkshire Hathaway achieved a total return of 1,972,595%, versus ‘only’ 12,717% return of the S&P 500 (including reinvested dividends). The compounded annual gain of Berkshire Hathaway amounts to 20.8%, versus 9.7% for the S&P 500 over the same period. Academic research also proves that the value investing approach consistently outperforms other investment strategies. Researchers coined this outperformance the “value premium”. Two of the leading researchers in the field of the value premium are Eugene Fama and Kenneth French. They have written numerous papers that consistently show the outperformance of value stocks over different periods and in different countries/continents. Based on their research, several charts consistently show the outperformance of value stocks versus growth stocks. The source of the following two charts is the website of Kenneth French. 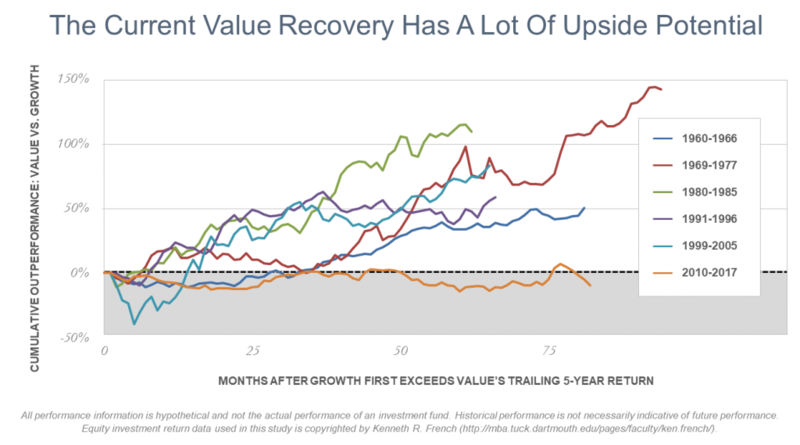 The first chart shows that value stocks historically significantly outperformed growth stocks, following a period of underperformance. Since 2010, growth stocks have outperformed value. This might indicate that a rotation to value is due to occur, with significant upside potential if we can use past performance as reference. The second chart shows that we are currently emerging from the longest period of growth stocks outperforming value. 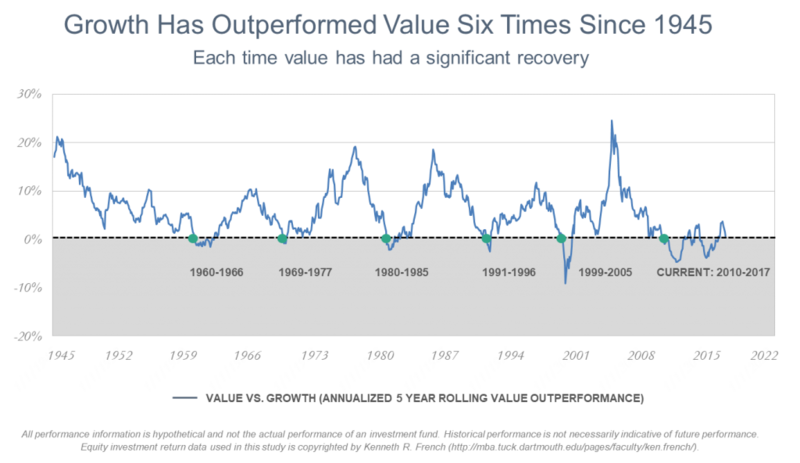 Since 1945, growth has outperformed value six times, followed by a significant recovery and outperformance of value stocks.